Their announcement was prompted by Bayer’s request to change its aspirin label to indicate it can help prevent heart attacks in healthy individuals. Aspirin generated $1.27 billion in sales for Bayer last year, and from Bayer’s request, it appears they want everyone to be taking their drug. Nearly 10 years ago, Dr. John G. F. Cleland, a cardiologist from the University of Hull in the UK, wrote an excellent article published in the British Journal of Medicine casting doubt upon the efficacy of aspirin therapy for prevention of heart attacks. Based on a series of meta-analyses from the Antithrombotic Trialists’ Collaboration, which is an enormous body of research following more than 100,000 patients at high risk for cardiac events, Dr. Cleland concluded that aspirin therapy was not saving lives. Rather, aspirin seems to change the way vascular events present themselves. The following table lists, chronologically, a sampling of studies showing that taking aspirin may do more harm than good. Regardless of whether you’re a man, woman, or diabetic, aspirin has failed miserably. This list of studies is not comprehensive. You will find much more information in the GreenMedInfo database, which lists more than 60 articles about aspirin’s toxic effects. Not only has aspirin failed to reduce the prevalence of heart attacks and strokes, but the list of its adverse effects seems to grow greater the more that it is studied. Chief among these is gastrointestinal bleeding, as aspirin interferes with your platelets—the blood cells that allow your blood to clot. According to one article, long-term low-dose aspirin therapy may double your risk for a gastrointestinal bleed. Aspirin also increases your risk for a brain bleed, especially if you are older. One study found a high mortality rate for elderly individuals who had been taking aspirin prophylactically when they suffered a head trauma, resulting in deadly brain hemorrhage. Regular aspirin use also destroys the lining of your gastrointestinal tract, increasing your risk for duodenal ulcers, H. Pylori infection, Crohn’s disease, diverticular disease, inflammatory bowel disease (IBD), and intestinal perforations. More than 10 percent of patients taking low-dose aspirin develop gastric ulcers. The damage to your duodenum—the highest part of your intestine into which your stomach contents pass—can result in duodenal ulcers, which are prone to bleeding. Even low-dose aspirin is proven to cause problems. A Japanese study found a higher incidence of bleeding at the ulcer sites of patients with duodenal ulcers taking low-dose aspirin (LDA) therapy, versus those not taking LDA. An Australian study also showed that aspirin causes gastroduodenal damage even at the low doses used for cardiovascular protection (80mg). And Japanese researchers found that aspirin had caused “small bowel injuries” to 80 percent of study participants after only two weeks of aspirin therapy. Each year, 15,000 people die and 100,000 people are hospitalized as the result of aspirin and other NSAIDs—and these are probably conservative estimates. But aspirin may be one of the oldest killer drugs! Strong historical evidence points to aspirin overdose as a major contributor to high death tolls during the 1918 influenza pandemic. 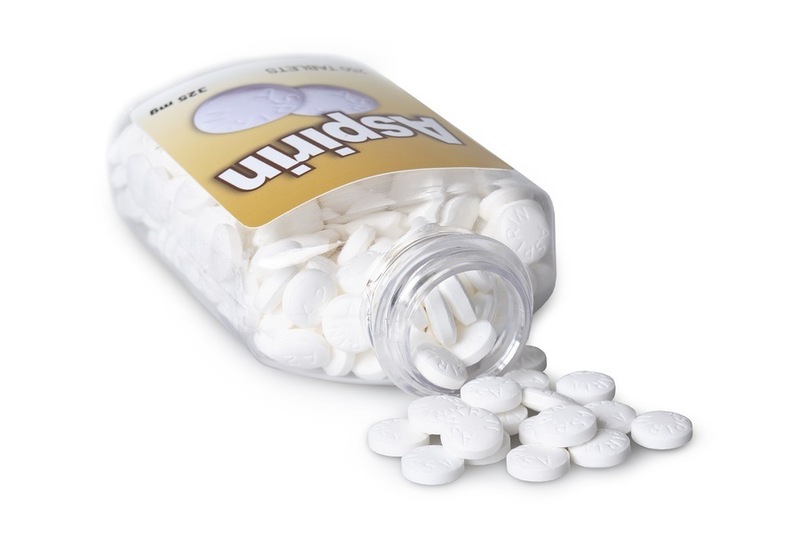 Aspirin toxicity can result in hemorrhage and fluid buildup in your lungs, which can result in death. If you are interested in the evidence for this, please read Dr. Karen Starko’s fascinating paper in Clinical Infectious Diseases. Getting back to the subject of your heart, with all of these adverse effects, why risk taking aspirin when there are safer and more effective alternatives? About one in three deaths in the US are attributed to cardiovascular disease—but 25 percent of those are preventable. The key is to address chronic inflammation, which can be accomplished by making specific lifestyle changes that encompass diet, exercise, sun exposure, and bare skin contact with the earth. In the remainder of this article, I will focus on heart-health strategies that work FAR better than aspirin. For additional information, please refer to our prior article about cardiovascular disease. My “heart-healthy diet” is vastly different from what government regulators and most conventional cardiologists recommend—because mine is actually based on science. The following table summarizes my basic nutritional recommendations, all of which will help quell chronic inflammation. For further guidance about how to proceed with your diet, I suggest reviewing my Optimized Nutrition Plan. Aspirin was thought to provide its protective action by inhibiting cyclooxygenase and thus favorably modulating inflammatory prostaglandins, which essentially decrease platelet formation and thus “thins the blood.” However there are far more effective ways to favorably influence this pathway. I recently interviewed Dr. Fred Kummerow who is nearly 100 years old and was the first scientist to document the dangers of trans fats. If you haven’t watched the video yet, I would strongly encourage you to do so. In the interview Dr. Kummerow explains that trans-fats prevent the formation of prostacyclin that thins your blood. By diligently avoiding all trans-fats, your body will happily make prostacyclin and keep your blood thin so you avoid heart attacks and strokes. Avoiding trans fats is imperative for your cardiovascular health. This is a FAR more effective strategy than eating trans-fats and taking aspirin to thin your blood. One of the primary benefits of exercise is that it helps optimize your insulin and leptin levels. Following the dietary guidelines above will move you closer to the mark, but adding exercise can bring you across the finish line. A sizable study published in The Lancet found that a mere 15 minutes of exercise per day can add three years to your life—even if you have cardiovascular disease risks. If your fasting insulin level is above three, seriously consider restricting your intake of grains and sugars until your insulin level is three or below (in terms of fructose, aim for a maximum of 15 grams per day). You might want to incorporate intermittent fasting into your diet and exercise plan, which can accelerate your progress. Intermittent fasting increases insulin/leptin sensitivity and mitochondrial efficiency, reduces oxidative stress, boosts growth hormone production, and helps you shed excess body fat. This is important as insulin and leptin resistance are at the core of most all cardiovascular diseases. Earthing may actually be one of the best-kept secrets for preventing blood clots—it’s an old practice gaining a new appreciation! In the simplest terms, Earthing (or grounding your body to the earth) is what occurs when you walk barefoot on bare soil, grass, sand, brick, etc. Free electrons are transferred from the earth into your body through your feet, and these electrons are some of the most potent antioxidants known to man. One of the most important discoveries about Earthing is that it makes your blood less viscous, which has profound implications for your cardiovascular health because virtually every aspect of cardiovascular disease has been correlated with elevated blood viscosity. Earthing is so effective at achieving a blood thinning effect that anyone take prescription anticoagulants like Coumadin need to lower their dosage if they start to implement Earthing. When you ground, your red blood cells have more charge on their surface, which forces them to repel each other, so they have less tendency to “stick together” and form a clot. This causes your blood to flow more easily and your blood pressure to drop. Even a very small blood clot can kill you if it lodges in a critical area of your body, so this “blood thinning” has profound health benefits. Research shows that it takes about 80 minutes for the free electrons from the earth to reach your blood stream and transform your blood. One warning: if you take Coumadin, Earthing is contraindicated as it may thin your blood too much. By implementing many of the strategies outlined above, you will make far greater progress than relying on drugs such as aspirin, which nearly always come with adverse effects. Remember, heart attacks are not caused by an aspirin deficiency, as some would have you believe!